Fittings are marked with F 877 and/or F 2159 ASTM Standards and the NSF-pw mark indicating third party certification by NSF International. NSF conducts random on-site inspections of the manufacturing facilities and independently tests PAL insert fittings for compliance with performance and toxicological standards. Poly Alloy (PAL) Insert Fittings are designed to be compliant with CANPEX™ Series tubing to provide a corrosion resistant water distribution system. Tested in plumbing applications in Canada for many years, PAL Insert Fittings have proven to be both durable and reliable year after year. PAL Insert Fittings are ideal for areas where metallic pipe or fittings are attacked by corrosion, hard or acidic water or electrolysis. These fittings provide a clean, NSF certified system which does not allow metal to come into contact with the water supply, which helps prevent corrosion and hard water deposits. 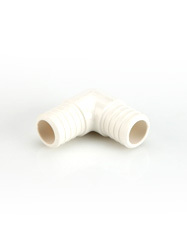 PAL insert fittings complete a totally plastic distribution system as they are durable, dependable and corrosion resistant for your most demanding potable water applications.